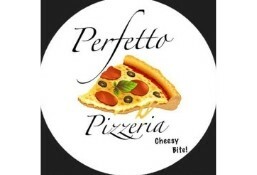 Perfetto Pizzeria is currently closed for delivery and it will open at . Choice of filling: Onion, mushroom, cheese, tomato, bell peppers, spinach. Served w/ avocado, grilled tomato, buttered asparagus & toast. Choice of Juice: (Pineapple, orange & carrot). Choice of coffee/tea. Cucumber, bell peppers, cherry tomato, mixed lettuce, onion rings, feta cheese and oregano..
Burrata cheese, tomato, strawberry balsamic glaze, salsa verde, olive oil dry oregano and rocket leaves. Kale leaves, quinoa, olive oil, orange zest cherry tomato and avocado. Gem lettuce, Lebanese toast bread onion rings, lemon juice bell peppers cucumber, tomato. [Garlic bread] Gem lettuce, Parmesan with traditional anchovy, chicken breast and Caesar dressing. Barbeque sauce glazed wings with celery sticks and ranch dressing. Crumbed arborio rice balls with salmon and dill leaves. Served with marinara sauce. Crispy fried calamari rings served with sweet chili mayo dip. Tempura fried shrimps tossed with harissa mayo and chives. Batter fried fish, served with mushy peas tartare sauce and grilled lemon. Crumbed tendered chicken breast, pan fried and baked in marinara sauce. Topped with mozzarella and cheddar cheese. Served with angel hair pasta. Pan seared salmon with warm artichokes, button mushroom, white beans, fava beans, French beans, sun dried tomato. Tossed with balsamic dressing. Arabic spiced lamb chops, chicken skewers, beef kofta served with pickles humus, garlic dip and Arabic bread. Bell peppers, mushroom, black olives sweet com, mozzarella and homemade tomato sauce. Mozzarella, basil leaves and home made tomato sauce. Mozzarella, buffalo cheese, basil leaves and home made tomato sauce. American corn, bell peppers, pineapple, black olives mozzarella and home made tomato sauce. Indian spiced cottage cheese and paneer with bell peppers, green chilli, mozzarella and Indian spiced tomato sauce. A trio of mozzarella, Cheddar and Parmesan with home made tomato sauce. Grilled chicken, bell peppers, mushroom, jalapenos, tabasco sauce and home made tomato sauce. Grilled chicken topped with onion, black olives green pepper mushrooms, jalapenos, mozzarella and home made tomato sauce. Veal bacon, Turkey ham, hawaiian pineapple, mozzarella and home made tomato sauce. Grilled chicken, bell peppers, pepperoni, mushroom black olives, mozzarella and home made tomato sauce. Pepperoni, mozzarella and home made tomato sauce. Barbeque chicken cubes, onion, bell peppers, mozzarella and smokey joes BBQ sauce. Indian spiced chicken tikka with bell peppers, mozzarella and Indian spiced tomato sauce. Calamari, prawns, mussels, fish, mozzarella, basil leaves and home made tomato sauce. Mix veg patty, cheese, lettuce, tomato and onion relish. Served with fries and salad. Slow cooked BBQ chicken with orange coleslaw. Serve with fries and salad. Fried egg, turkey bacon, avocado salsa, smoked cheese sauce onion rings, served with wedges and salad. Chocolate and fresh fruit pizza slice.